It gives us immense pleasure to share that, GLBIMR is organizing "HR Conclave 2017 - Leveraging HR for creating Competitive Edge" on August 05, 2017, Saturday from 9:30 a.m. - 4:30 p.m. at GLBIMR campus, which will bring the most efficient HR fraternity discussing about the concurrent concern areas in HR & People Management. In this era of risk and instability, organizations find themselves on a precipice to thrive and survive. To attain this precarious balance, the focus of today’s organizations is on developing and leveraging Human Resources as the key differentiator for attaining competitive edge. The Conclave is designed to learn from the experiences of successful leaders and organizations on how HR will need to drive change by engaging strategically in workforce planning and employee engagement and develop leaders both for business and HR in this new digital paradigm shift. Panel Discussion -II: Technology and Employee Today; What Role should HR Play? We hereby invite all HR Professionals to this highly insightful learning platform. We will be delighted to have your esteemed presence. 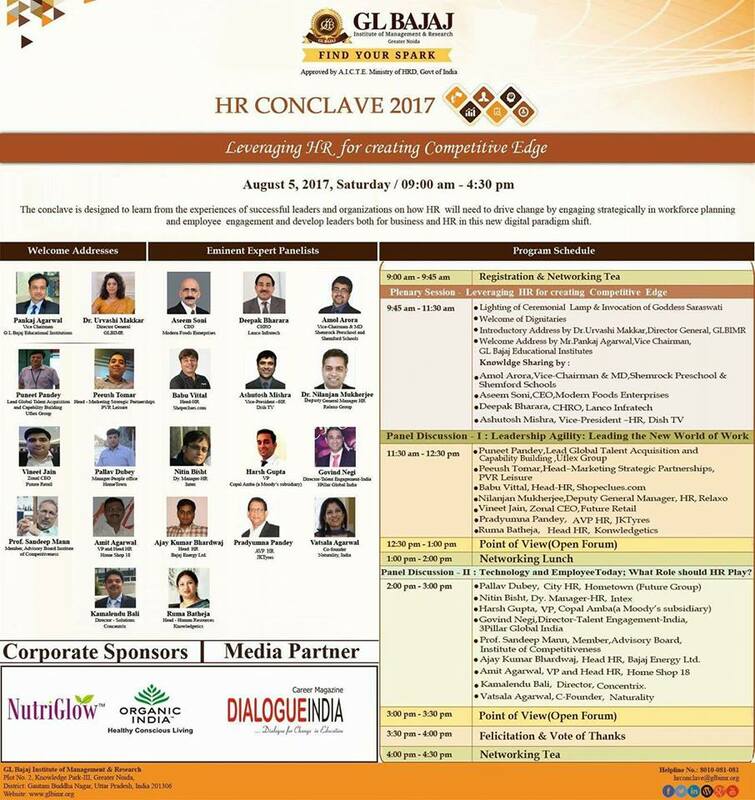 kindly refer to the Program Schedule of HR Conclave 2017 .